Roughly one year before the pages of this book were due at the printer, we knew we were in trouble. Due to some bizarre scheduling on the part of three different publishers, we committed to produce nine — yes, nine — books in one year, from July 1996 to August '97. Presleyana is one of the titles caught up in that conglomeration. Fortunately, knowing so many Elvis dealers, it was also one of the two books we could get some editing help with. (Movie/TV Soundtracks & Original Casts being the other.) Having a good knowledge of recent sales and current trends were requirements, not to mention being willing and able to devote several months to the project. When discussing the task with Bob and Carbl Alaniz, of Soundz Good Records, it became clear we found a match. Bob, along with a separate team of advisors he recruited, began by wading through the existing data base, updating prices and adding listings as needed. He also poured through all of the mail from readers, making corrections and absorbing suggestions. When Bob and Co. finished phase one, the files were returned to us in Washington for further fine-tuning and all the finishing touches. 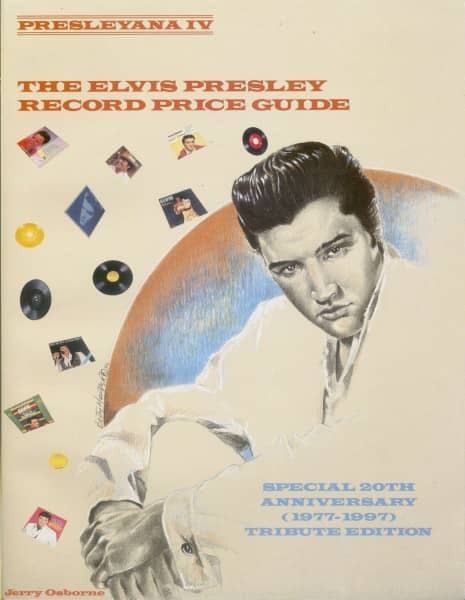 Without the help of Bob and Carol, and friends, it is doubtful this guide could have been completed in time for the 20th Anniversary events and the annual August extravaganza in Memphis: International Elvis Tribute Week. But they TCB'ed —they took care of business. Thanks for a job well done. reprinted from earlier cover slick artwork, or simply continued using covers from an earlier printing, the effect still creates a lower price on the original printing than usual. To indicate this anomaly, something along the lines of: "Price reflects RCA's continued use of this same cover, with no discernible differences" will appear. This should make it possible for you to know whether a cover for a late '60s issue is identical to ones used in the early '60s, or if an early '60s disc is in fact in a late '60s cover. As with every new Presley guide we do, label and cover descriptions have once again been expanded. 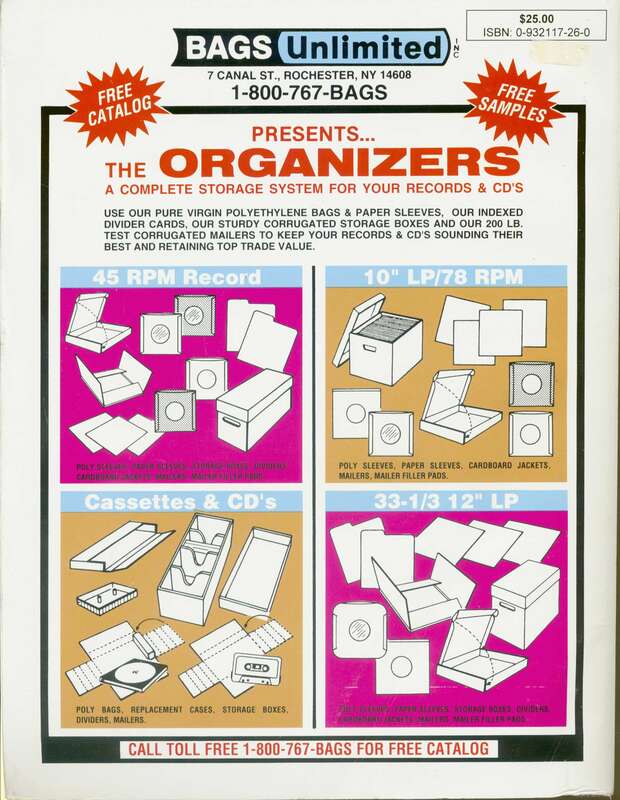 To merely identify a cover as having the catalog number at the upper right, or lower left, as in earlier guides, doesn't begin to adequately describe and differentiate cover variations. As to the separate pricing for each part, the feedback we have received is that, while it takes some getting used to, it is truly the only sensible approach — especially when it comes to Elvis Presley collectibles. Only then can the difference between packages where the bulk of the value is in the cover, such as the Chicken of the Sea Aloha from Hawaii Via Satellite or International Hotel box sets, be sorted out from those where the greater value is in the disc, such as Elvis (LPM-I382) with the alternate take of Old Shep. Separate pricing appears in all three sections of the guide, although only in the EP and LP chapters are grand totals given for complete packages. Adding up all of the parts of a package for you will eliminate your having to total the appropriate numbers. Do not, however, automatically use the total package price if any of the significant parts are missing. For singles, where the individual parts are pretty much limited to a disc and a picture sleeve, the totals are quite easy to figure. Whenever possible, we provide recording serial numbers. Having these serial — or identification — numbers in hand, it is not necessary to play the record to know if it is the 35 rpm single of He Touched Me, or It's Now Or Never without the piano track, or Elvis: A Legendary Performer, Vol. 2 without the false starts and outtakes. Each of these oddities has a take number unique unto itself. RCA's production procedure becomes clearer all the time and makes it easier for us to understand how many of their manufacturing errors came to be, as well as why so many corrections are found on their stampings. New in this edition is a supplement to our record manufacturing chapter. By William Brown, this essay digs even deeper into RCA's pressing plants, label makers, and identification coding. Évaluations de clients pour "Presleyana IV - The Elvis Presley Record Price Guide"